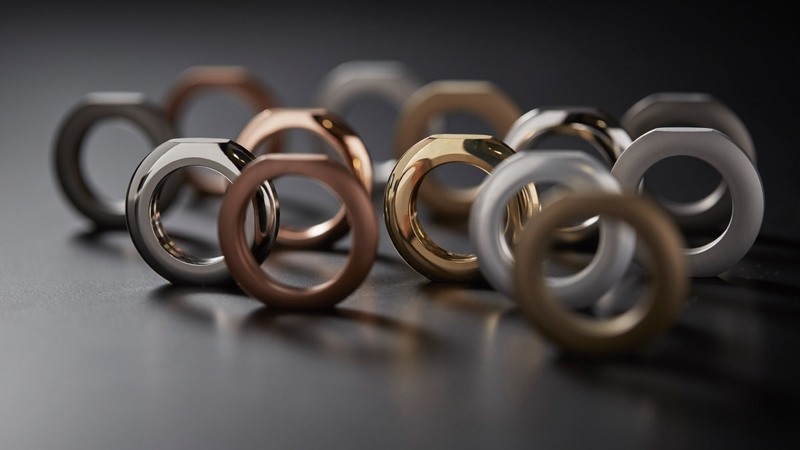 The modern jewelry industry uses gold alloys of different colors to create jewelry items in order to attract clients and enhance the effect of the product. Pure gold, which has a yellowish-reddish hue, is not used in jewelry because of its low resistance against wear and tear and insufficient firmness. 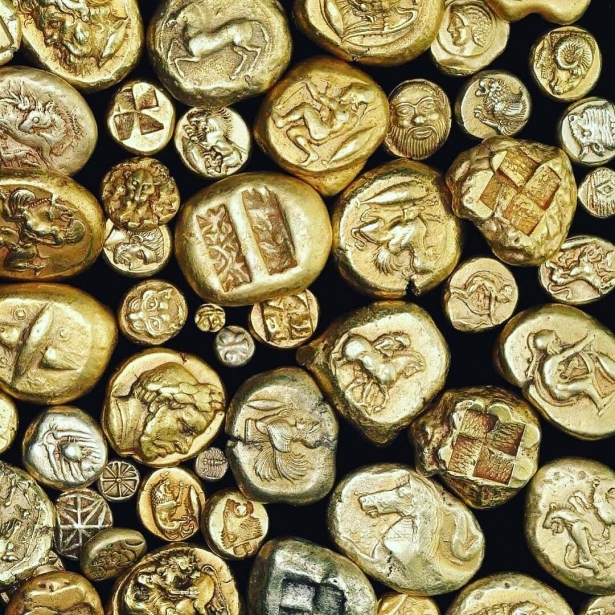 Classic gold alloys along with other metals, mostly silver and copper, are used to create precious jewelry. Over the last decade, jewelry items made from non-traditional gold alloys have been gaining popularity. Alloys of the most unusual hues are called intermetallic compounds. These are chemical compounds of gold with "low density" metals - cobalt, aluminum, potassium, and "high density" — silver, tin, lead. Intermetallic compounds are obtained by fusing a strictly fixed ratio of components determined by the chemical formula. These metals are characterized by having low plasticity and high fragility — they can crack or be fractured after the fall or become dented from a blow, so it limits their broader usage in the jewelry industry. Intermetallic compounds include blue gold and its hues, ranging from light blue to saturated violet. 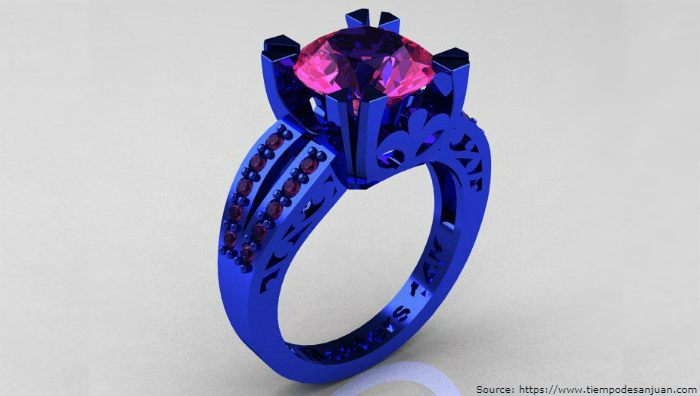 In the photo: a wedding ring made of blue gold with a pink sapphire. Intermetallic purple is obtained by combining pure gold with aluminum or potassium. Blue gold is a gold alloy with indium — AuIn2, containing 46% of 11-carat gold and 54% . The blue intermetallic compound is very fragile. The compound of gold and gallium — AuGa2 has a lighter bluish hue and contains 58% of 14K gold. This gold alloy is more solid than AuIn2. The manuscripts of the medieval alchemists contain information that they were able to obtain a blue-colored gold in those early times. They achieved a blue hue effect by fusing together the two components in the following ratio: 18 parts of the precious metal and 6 parts of sponge iron. Attempts of modern jewelers to obtain blue gold, using the ancient alchemists’ recipe, have failed. At the beginning of the 20th century, the well-known Argentinean jeweler Antoniassi invented a method of producing a blue-colored gold. He added cobalt into the pure molten precious metal. Competitors sought a way to find out the mystery of the alloy and demanded Antoniassi to reveal the composition of the metal as required by international rules. Publication of the technological process with a list of all required components and their exact quantities is necessary to confirm the fineness of metals from which the jewelry has been made. The fineness must comply with the current regulations. 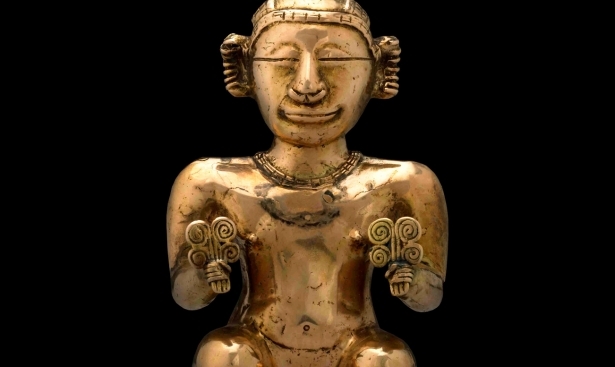 The South American jeweler published the composition of his alloy, but other craftsmen could not get the blue-colored gold from the components listed in his list. The real details of the chemical process were kept secret. The technology of making the blue-colored gold by the goldsmith Antoniassi still remains unsolved. One of the ancient alloys of gold that is colored in black and blue is called Shakudo, a transliteration from Japanese – "shakudō." In its composition, pure gold constitutes only 5%. It was used in the Middle Ages in Japan to make samurai weapons — daggers and swords. 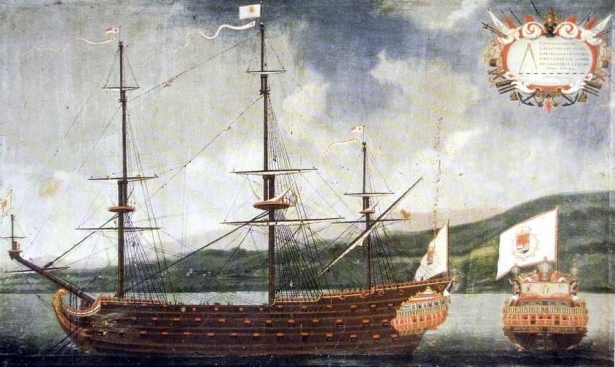 Earlier, it was believed that gold "shakudo" had been the original invention of the Japanese. Later on, studies have showed that the composition of this alloy was known even to the ancient Egyptian, ancient Greek and Roman jewelers. 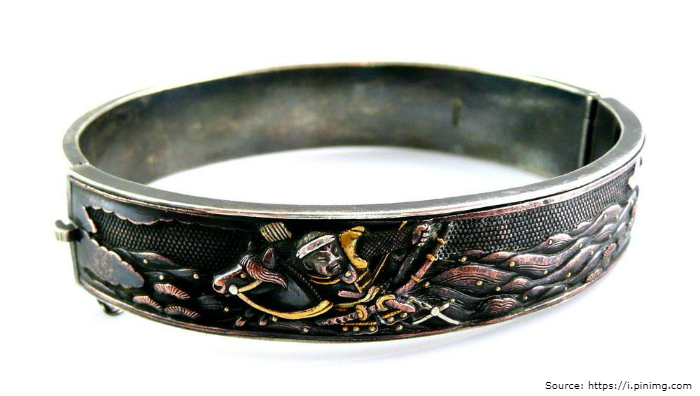 In the photo: an ancient Japanese bracelet made of gold "shakudo" and silver. The original color of the metal is intended to attract the attention of clients to the jewelry. Due to the poor malleability of the alloy, jewelry pieces made of blue gold are rare and therefore in high demand. Due to its fragility, blue gold is used in jewelry and other precious accessories mainly as parts of the trim. This unique material is also used in the making of necklaces or bracelets from plates. Manufacturers of expensive watches use blue gold to add opulence to their products. Owing to the bright intermetallic compound, the watches look spectacular and exquisite. 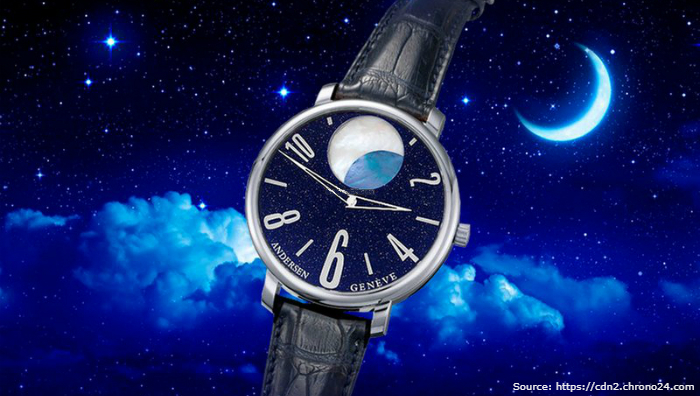 In the photo: the case of Swiss men's watches from Andersen "Kamar The Moon" is made of 18K white gold, the dial of a mechanism is made of blue 22K gold. The price of a precious accessory is $30,000. Throughout the ages, people valued precious items and sought to accumulate the noble metal. As of today, investment gold bars serve as the most important tool for preserving and accumulating personal savings.